Avocado Toast, Chocolate Peanut Butter Smoothies, and Greek Breakfast Burritos are just some of the yummy and healthy breakfasts featured here! All of the following recipes are quick and easy to prepare, require minimal ingredients, and are nutrient rich and fresh! They all just happen to be vegetarian too! Sometimes you just need a break from all the bacon and eggs! The New Year is the perfect time to start! Many can also be made vegan! 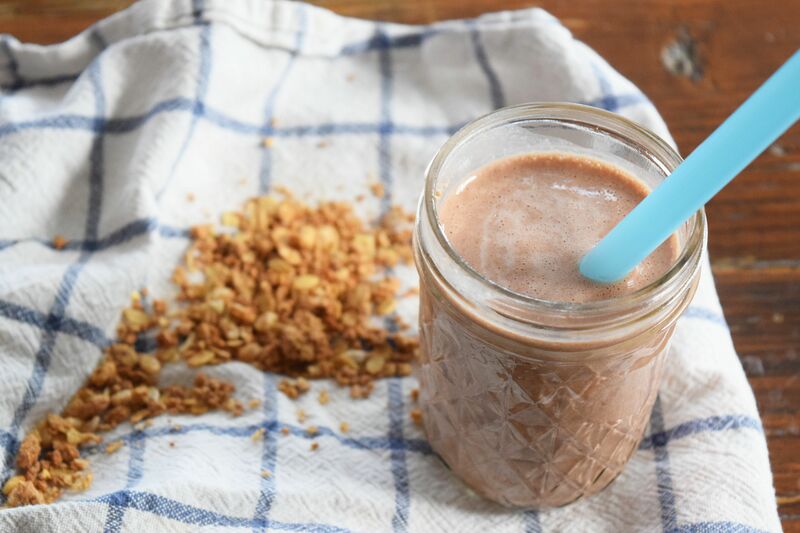 This protein-packed smoothie is also very filling! Oatmeal is added to the peanut butter, and chocolate protein. The oatmeal will keep you full all morning long and the protein will have you ready to set a new PR! Any type of milk can be used in this shake, so it can easily be vegan! Toasts are a quick an easy breakfast. They are low-calorie and are super versatile! This one includes ricotta cheese, freshly sliced apple, and honey all on top of toasted whole-grain bread! It is crisp and delicious! So much better than plain old buttered toast! Quinoa for breakfast? Yeah, it's real! This blueberry vanilla quinoa bowl can be served hot or cold. It's protein packed and just a tad sweet! It cooks up very quickly and is a great breakfast to take to work! This Greek Inspired Breakfast Wrap is quick and easy to whip together any day of the week. It only requires a few simple ingredients and one pan! The Kalamata olives give the wrap a tasty zip without adding many calories! They can also be wrapped and frozen and taken to go! Avocado toasts are a super quick and easy breakfast. Spice them up with queso fresco and a sprinkling of paprika! The healthy fats in the avocado will keep you full all morning and are also healthy for you! Tropical Bliss in the middle of winter? It can be done! Refreshing, sweet, crunchy, tart...these acai bowls have it all. Plus, they are packed with anti-oxidants! This recipe includes pineapple, coconut, and candied ginger, but any fruit can be replaced! Blueberries, bananas, raspberries, and strawberries are also delicious additions. It blends up quickly and can be easily taken to go! MMM, Peanut Butter and Jelly sandwiches really bring me back to childhood! This is a fresh, grown-up version of the classic sandwich! Just use a nice all natural peanut or nut butter with fresh fruit! I used a whole grain blueberry waffle and fresh blueberries!